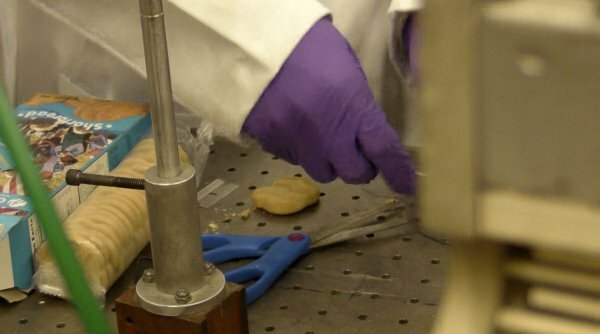 Rice University graduate students working in chemist James Tour’s lab proved that graphene can be made out of almost anything, including Girl Scout Cookies. And if you make it out of a box of Girl Scout Cookies, they could be worth $15 billion. TG Daily reports that the lab reached out to a troop of Houston Girl Scouts to show them how it can be done. Graphene is a material discovered by a team out of the University of Manchester in 2004. It is a sheet of carbon atoms bound together with double electron bonds (called a sp2 bond) in a thin film only one atom thick. Atoms in graphene are arranged in a honeycomb-style lattice pattern. Graphene has many uses. The Chinese Academy of Sciences has found that sheets of graphene oxide are highly effective at killing bacteria such as E-coli. This means graphene could be useful in applications such as hygiene products or packaging that will help keep food fresh for longer. Rice scientists detailed how graphene - a single-atom-thick sheet of the same material in pencil lead - can be created from almost any carbon source, including food, insects and waste. Graduate students Gedeng Ruan, lead author of the paper, and Zhengzong Sun calculated that at the then-commercial rate for pristine graphene -- $250 for a two-inch square -- a box of traditional Girl Scout shortbread cookies could turn a $15 billion profit. Tour thinks that the cost of graphene will drop quickly as commercial interests come up with ways to make it in bulk. "They learned that carbon - or any element --in one form can be inexpensive and in another form can be very expensive," Tour said. "You could probably get a very large diamond out of a box of Girl Scout Cookies."